Dulux’s colour of the year; Spiced Honey, is certainly contrasting to Pantone’s bright and bold Coral colour of the year, for 2019. Spiced Honey is a muted, warm amber tone; a versatile colour that will create a cosy and calming atmosphere, that can be incorporated to nearly any colour palette or design scheme. This colour was inspired by reflections of the chaos and unpredictable events across the world in 2018 and was selected to enable us to create safe havens and areas of comfort to retreat to, in our homes. 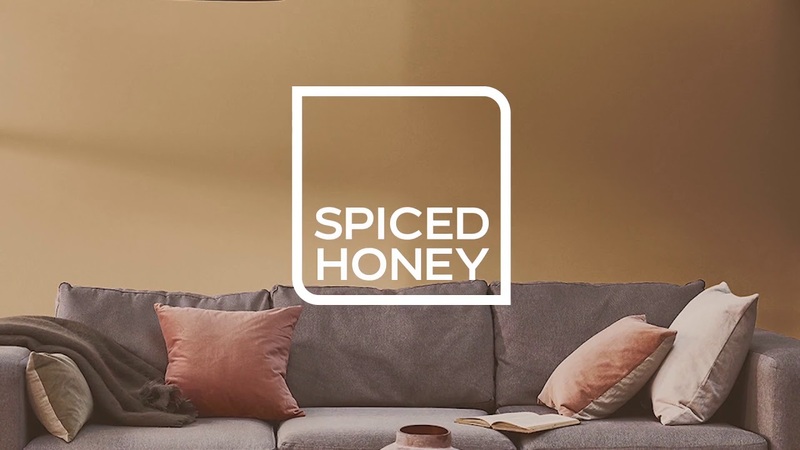 Spiced Honey will not simply be a design trend that we paint our walls with, but will hopefully be a state of mind that we can apply to our lives and homes, by incorporating it into our design schemes! Dulux and designers hope that this colour will create different states of mind when applied to individual palettes; it is believed that with the correct colours alongside, Spiced Honey will be stimulating, energising but also nourishing and calming (dependent on the room’s setting or the space’s purpose and design scheme). A palette that combines a few already classic and popular colours but brings them together to create an innovative and fresh colour combination – deep blues, rich burgundy and pastel pink shades. We think this palette would be great incorporated into a design scheme for a Study or Office area; the ideal place to ‘think’. A palette of muted and soft pastel colours; think of powdery pinks or baby sky blue tones. We think this palette will work wonderfully in a Bedroom space; the perfect serene place to ‘dream’. A palette of deep forest greens, rich teals and warm terracotta tones. This palette will work beautifully in a Bedroom or Living Space, creating a cosy, intimate & comforting environment. A bold and adventurous palette, combined of vivid reds, pale pinks, greens and blues with crisp white and grey tones. We think this palette will be fab for a Playroom, Dining or Living Room, to create a fun, motivating and playful atmosphere; the perfect productive area to ‘act’. Polished natural woods, textured soft furnishings, textile rugs, pale woods and botanical prints are all ways to enhance Spiced Honey, with simple accessory & furniture pieces. We’ve put together a simple concept board for inspirations and product ideas to incorporate into a design scheme, based on 2019’s Dulux Colour of the Year, Spiced Honey. The concept that we have put together is based on the ‘Soft Pastels’ scheme; combining Spiced Honey with muted and pastel pink shades, textured wallcoverings (Tessera 1071.02 by VESCOM*), a tan leather sofa, textile shaggy Aztec rug, white & wooden furniture/lighting, textured soft furnishings (pink pom pom cushions), matte muted accessories (ombre ceramic pink round vase) & sheer floaty, bright white voile curtain fabric (Rosa Pearl by KAI fabrics*). 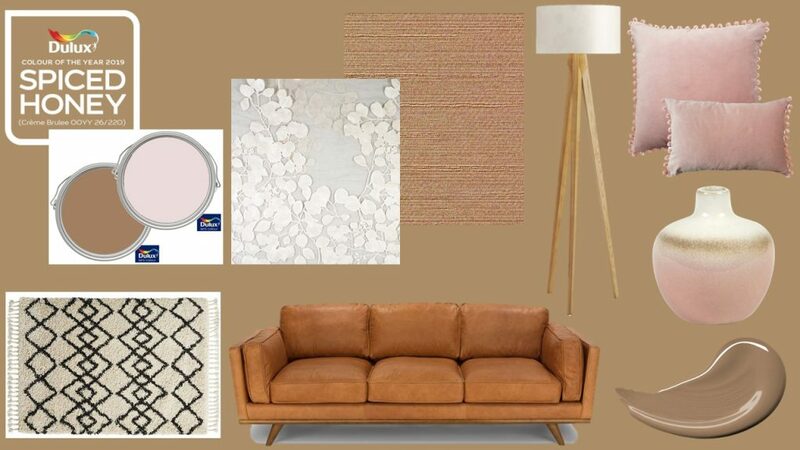 *These items are available to purchase directly from our store, as we are stockists of VESCOM & KAI. Please contact us with any enquiries, via our website!